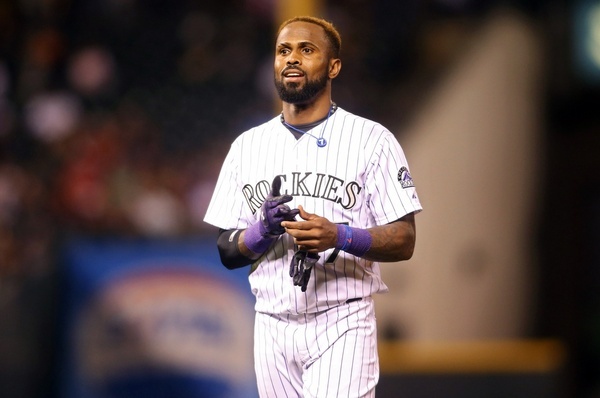 I would prefer not to talk a whole lot about former Jays shortstop Jose Reyes around here. For obvious reasons, I think — and no, that’s not because I spent a whole lot of time defending his play on the field last season. Reyes, the Rockies announced today, has been reinstated from the Restricted List and Designated For Assignment. They now have ten days to trade him, release him, or get him to accept a demotion. Thaaaaaat’s something. Thought it’s maybe not surprising. Reyes was, of course, on the Restricted List because of his arrest in an alleged domestic abuse incident that took place last Halloween (charges were laid but eventually dropped because, according to ABC News, his wife was not cooperating). He’s also kinda bad now. And of little use to the Rockies given the success that Trevor Story has had this season after being thrust into the club’s starting shortstop role (though he’s come back to earth after a ridiculous start). But obviously Reyes’s eroding baseball skills are only part of his story now. It’s a story that can’t be told only in baseball terms. No great cosmic injustice has been done that has brought Reyes to this point in his career and life. There are choices that he made that are too wrapped up in it, and pain he has surely wrought that shouldn’t be undermined by narrowly viewing that part of the story as merely “unfortunate” for him or his career. Easy as it might be, we can’t let ourselves get too wistful about what was once a smiling, carefree ballplayer with all the talent in the world, who now finds himself a villain and unwanted. But that is certainly part of the baseball side of the story. And it’s remarkable now to think of the excitement we had in 2013 and 2014 for the fact that this guy actually Played For The Toronto Blue Jays. That he was a massive disappointment on the field, not to mention a declining asset, was made obvious by the way he left town: practically as pure salary dump to offset the incoming contract of Troy Tulowitzki, in what was essentially a deal of Jeff Hoffman, Miguel Castro, and Jesus Tinoco for Tulo and LaTroy Hawkins. It was a sudden and undignified rebuke of his value as a player. It feels as prescient now for its off-field aspects as it does for how quickly Reyes’s stock has dropped strictly as a baseball player. Will other teams want him? Will they line up to get him for cheap like the unseemly Yankees did with Aroldis Chapman, or did his poor play down the stretch with the Rockies (62 wRC+, -2.3 UZR, -0.4 WAR) give teams enough of a pretext to look the other way here? Clearly there is a cynical cost-benefit analysis that teams do when players come available that present the kind of problems Reyes now does. I’m not sure he passes that analysis at this point — that likely depends on how much of his salary Colorado is willing to eat — and though I’m not opposed to people getting second chances, I know I’m not going to be sad if he doesn’t. That certainly would have been an unfathomable thought a couple years ago, but it is what it is. And it will be interesting to see how it all plays out. Looking through the ranks of professional sport, though, it’s not difficult to see how easily teams — despite how much they love to talk about the high value they place on “character” — will overlook off-field ugliness in the name of adding talent. Is it a small consolation that we’re at least talking about these things now? I suppose so. But that’s about as positive as I can get about this whole thing. And I, too, defended him when he was with the Jays. Then he turned out to be a scumbag. So, count me as one of those who shrugs at his sudden fall from grace. I’m sure some team will take a chance on him, especially if he clears waivers (I’m betting he will) and I’m just happy with the knowledge it won’t be the team I cheer for. My money’s on the White Sox picking him up. Especially now since Jimmy Rollins was recently DFAed due to injury. There will be MLB teams who decide not to pick him up and who will pat themselves on the back and convince themselves they passed on him because he’s human garbage. But there are Aroldis Chapmans out there to remind us that if a player is good enough, and not an aging shortstop in rapid decline, they’ll shrug off any off-field horror show.